Come on an adventure with Flo, a business professional with a deep desire to have more clients, money and success flowing her way. As much as Flo wants More, she holds herself back with her judgments and fears of not knowing enough, not being good enough. Flo’s life is turned on its side when an enchanting wise woman mentor, The Business Alchemist, mysteriously appears on a particularly discouraging day. 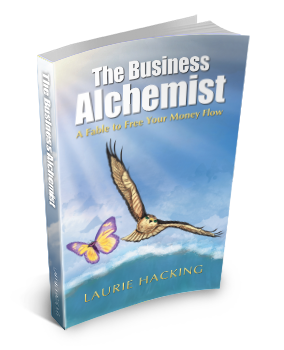 With the help of animal guides Hawk and Butterfly, The Business Alchemist challenges Flo to stop playing safe so she can claim how worthy she is to create a thriving business, a beautiful life and be free and in flow. What new perspectives can I embrace from this challenge so I can open to something extraordinary and new? Get your copy of The Business Alchemist today.